I took the picture at one of the refugee camps in Tanzania set up by the government. I was trying to show the plight of the children who were lost and never reunited with their families. It was a hot and sunny day and I was a bit tired, having visited several camps in that area. 8 year old Kindaya Chikelema from Burundi stood in front of a notice board. 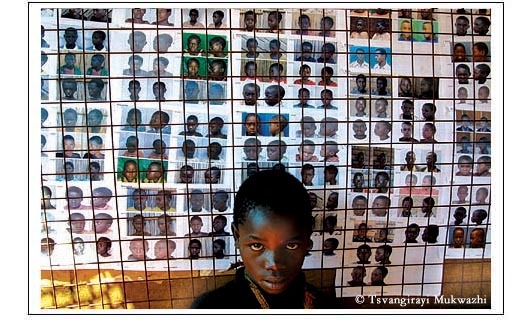 More than 4000 children were lost while fleeing the war in Brurundi and Rwanda. Kindaya was one of the lucky children to be found by his parents after they saw his picture on the notice board at one of the camps. The many letters mailed all over the world had produced few results and it was ‘door to door’ time. I had placed the loose collection of prints on Dexter Tiranti’s table at the New Internationalist Magazine in Oxford. I remember Dexter’s letter the following year, regretting that he could only use six images from our agency, as the selection already had too much from Bangladesh. That started a long relationship between our organizations and led to my involvement in Southern Exposure, a platform, like Drik, for promoting photographers from the majority world. The Net has helped, but most of our contacts have come from information gleaned on motorbike rides down the back streets of Hanoi, or a meeting in a paddy field outside Beijing, or a visit to a museum in Tehran or similar opportunities for meeting photographers, whom I would not have come across in the mainstream directories. I remember excitedly going through boxes of prints that only fellow photographers or close friends had seen. Of newly found friends telling me of people I must meet. Friends from the Drikpartnership, students, colleagues at other agencies and at World Press Photo. Friends, who like us, have believed in the plurality of image sources and have been active in trying to bring about a change. The images too have been different. These are not the ‘developmental images’ extolling the virtue of the latest World Bank fix, or the ‘news’ images that choose not to see beyond editorial briefs. The abandon of the flutist in Bangladesh or a ‘sweet fifteen’ dance in Peru, or the careless joy of the children on the branch of a tree in South Africa represent a personal involvement of the photographer, and a relationship with the photographed, often missing in the ‘big stories’ that the major agencies send their photographers to ‘capture’. Little of what you will see here is newsworthy to mainstream media. No hype reaffirms the success of a particular development plan. It is revealing that these majority world photographers have an insight and a sensibility that is strikingly different from that of their big name visitors. It is telling that an altogether different story emerges when a different pair of eyes is behind the lens. In their own back yard, they see a different world. chose them as my representatives. Yet they rule our lives. can overturn the hopes of the majority of the globe. Dwight D. Eisenhower, in a speech on April 16, 1953.
considered, the price is NEVER worth it. Shahidul Alam. 7th April 2002. London.